My initial reaction to Amari Cooper’s trade to the Cowboy’s was one of complete and utter annoyance, I said at the time and I’ll say it again with the Cowboy’s being good at home and bad away the chances are he will not turn out to be worth a top twenty pick, possibly even top 15. Don’t get me wrong, I don’t hate the move or the player, I’m just don’t like the price. Having slept on it though, I haven’t changed my mind to that point but I’m now starting to understand exactly what this means for the Cowboy’s in 2018. There’s an old saying, if you budget for failure that’s all you’ll achieve and that is Jerry Jones to a tee. The NFC east, rather than be the powerhouse we were all expecting it to be is turning out to be a bit of a dumpster fire so only two games back with 9 to play the Cowboys, like the Eagles too won’t feel like they’re out of this. As it stands the defence is currently playing like one of the better defences in the league. What they need is points, the Cowboy’s front 7 is sneakily pretty decent so giving them a lead to protect and bring blitzes could really elevate them. Coming back to Amari Cooper, what does this mean for the Cowboys. The answer is pretty simple actually. Double Coverage. Does Amari Cooper demand double coverage? On the whole I’d say he does, and that has the potential to change the way the entire Cowboy’s offence runs. They’re playing in front of their opponents at the moment, they rank 30th in the league of plays more than 20 yards with just 16 and they rank 28th in first down percentage. Dak Prescott’s passer rating over the middle is very poor, particularly in the short to medium. The telling thing about this whole offence is that they haven’t had a single passing attempt over the middle of the field longer than 20 yards. Not one, not a dropped catch, not a missed throw not a single attempt through 7 weeks. 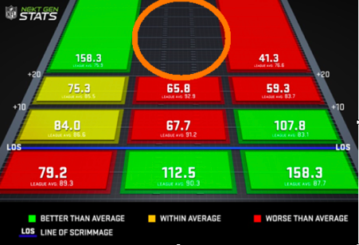 While some teams have been slow embrace analytics the Dallas Cowboy’s are not one, they will understand every wrinkle, nook, cranny and flabby fold of its offence and have an idea of what causes it. What is immediately apparent, apart from short comings in the Cowboy’s wide receiver group is that those short comings are affecting the entire offence. This will quickly become a metaphor for what a number one receiver can do for you but what I immediately glean from this is that Dallas are currently unable to manipulate opposing safeties with the crew they currently have. Being able to go man to man on Dallas’ receivers allows opposing high safeties to patrol, roam and close down the middle of the field as an area to target and leaves the strong safety to sit in the box to combat Ezekiel Elliot. Amari Cooper is good enough to go some way to combat that problem, he will at least command the attention of the high safety and draw double coverage some if not most of the time, but if that’s enough to move the safety it can create space for the likes of Cole Beasley in the slot who’s strengths lie in the middle of the field and Allen Hurns / Michael Gallup on the other side. We could then see more space for Geoff Swaim who has quietly been improving picking up a few receptions every game which could possibly move the stronger safety and a line-backer to deal with him which makes Ezekiel Elliot’s life easier, particularly in play action. Statistically I don’t expect him to put up 1000-yard seasons, or even be particularly spectacular stats wise at all because that’s not what the Cowboy’s offence is, Dak isn’t suddenly going to turn into Drew Brees and start slinging it all over the yard. If you only throw for 3500 to 4000 yards a season the chances are more than a quarter of them aren’t going to a single player. His impact schematically should, all going to plan, be significantly greater. Sooner or later, someone is going to bring this back around to Dez Bryant, so I might as well. Dallas have moved on from Dez, while he may still be able to play if rumours about him not being a great Pro, being a nuisance in meetings or worse being late or not turning up for them its not difficult to understand why. As with everything looking at the rest of the league can provide as many answers to a question and despite their being receiver needy teams all over, Jets, Browns, Cardinals none have moved for him, even the Patriots chose to move for Josh Gordon in a trade than add Dez. This tells me teams no something that we don’t as much as the Cowboy’s not going back to him cap in hand does. As for whether this trade is worth a first rounder, I don’t think so but its important to remember, and Football is a permanent thing! We’ll be playing in 2019, 2020, 2021 (though probably less with the new CBA) and so on and so roster moves need to be considered in the context of this and what they’re for. Gil Brandt on twitter doesn’t believe there is a top 20 wide receiver in the next draft class as it currently stands so adding talent at the position may prove difficult even if the price for Cooper may be a little high they may have had to reach anyway, so why not reach for a proven commodity. There are implications as to what this means for the Cowboys as a whole, for a start it’s a vote of confidence in Prescott because they wont likely be trying to replace him without a first-round pick. Only hindsight will tell us if this was a good move even if we all have a feeling. Previous story What Should We Expect From The Tampa Bay Buccaneers Defence?